Measured unstretched: Size 1: Child – measures 45cm (17.5”) Size 2: adult medium – measures 52cm (20.5”) Size 3: adult large – measures 57cm (22.5”). Since when did “snowflake” become an insult? Or maybe a compliment, as “snowflake” seems to be a term used against people who are kind, decent, caring - basically, human. So here’s a subtle statement hat for snowflakes everywhere; inspired by traditional knitting styles of the British Isles - Fair Isle and ganseys. Snowflakes are amazing. They “nucleate around mineral or organic particles in moisture-saturated, subfreezing air masses. They grow by net accretion to the incipient crystals in hexagonal formations. The cohesive forces are primarily electrostatic.” (Science, quoted from Wikipedia, so it must be right). One snowflake may be made up of 10 to the power of 19 (10 quintillion) molecules of water. Apparently. They are, simply beautiful and amazing. Celebrate your snowflakery with this hat in three sizes - child, medium and large adult. Snowflakes always win out in the end. They survive, outlasting winter on the highest ground. This hat takes a traditional Fair Isle snowflake motif, and mashes it up with a gansey Channel Island cast on, a 3 needle cast off and possibly gansey yarn - you can use DK too - just double-check your tension/gauge first and adjust needle-size or pattern, accordingly. 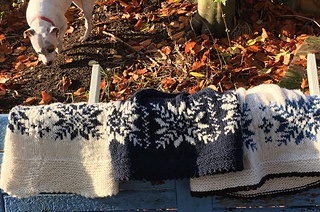 I also used Wooltops 5 ply Guernsey which is not in the database, for one sample. Great pattern for guernsey/sport weight leftovers but if you have none available, try it with a DK - adjust needle size or drop out a section of small motif in chart, if you need to. Knit a Snowflake. With this hat… everyone gets a trophy.